“No matter what gig, I always just shut my eyes and pretend we’re playing to millions.” Catfish and the Bottlemen—not an easy name to say in a hurry—is the kind of band that values the loud and the brash. Big choruses, big haircuts, and a big, no, huge dose of confidence has seen this band of old friends blow up this summer, ahead of the release of debut album “The Balcony” in September. 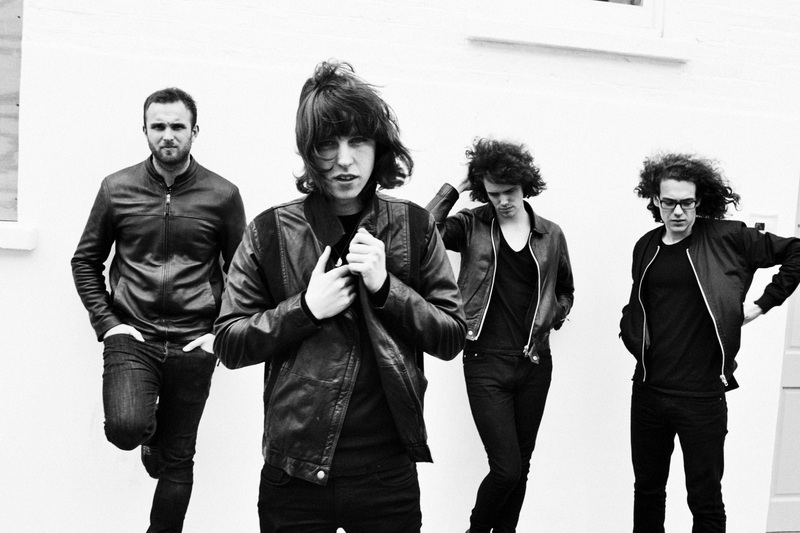 But, don’t be fooled, the Bottlemen are anything but new to the road. Berlin Beat met Catfish and the Bottlemen back in August. Seated on a sun-drenched bench overlooking the Spree, just down the road from FluxFM (where the band was due to play live on air later that afternoon), the four-piece—McCann, Johnny Bond, Benji Blakeway, and Robert Hall—were in town for Berlin Music Week, the band’s first ‘proper’ show in the capital. Whilst the rest of the band set up in the FluxBau, McCann, the band’s appointed interviewee, talked with infectious, overwhelming enthusiasm—an impressive feat considering the band was literally just out of the bus after a sleepless drive from Amsterdam. Essentially, Catfish and the Bottlemen has a few, clear-cut priorities. The four work really bloody hard—last year they played around 100 shows across Europe and the UK: “We’ve played every single venue in the country.” They really, really love their fans: “Our fans are just a group of mates now, you know?” And most crucially, they have massive, massive ambition. Since August, the NME has, in fact, reviewed “The Balcony”—and as McCann rightly predicted, it was not at all favorable. It dubbed the group as “dated” and “about nine years too late,” aligning the Bottlemen with early noughties bands like The Kooks and The Courteeners: perhaps an interesting reflection on musical trends and contemporaneity, but a discussion that’s wholly irrelevant to Catfish and the Bottlemen’s simple mission statement. As McCann put it, “we never had any money, we never had any help, so we’re not afraid of losing it. It’s irrelevant! We may as well just make the best of it.” And, to be fair, the lead singles from the album, “Kathleen,” “Pacifier,” and “Homesick” definitely do draw on that early 00’s huge-indie-chorus tradition. But what they do, they do well. McCann likes a band that “makes you put your arms in the air,” and that’s exactly what these songs set out to achieve. Catfish and the Bottlemen play tonight at Comet Club in Berlin. The show begins at 21.00. This entry was posted in Interview and tagged Catfish and the Bottlemen, Feature, Interview, Welsh. Bookmark the permalink.